Members of this company left Winter Quarters as early as April 5th to join with the larger group. Everyone gathered to a place about 20 miles from Winter Quarters on the banks of the Platte River. There they worked repairing wagons, organizing supplies, and chopping firewood. It wasn't until the 16th of April that the company was officially organized into the hundreds, fifties, and tens, with captains appointed and they started on their way. Once organized, this vanguard pioneer company consisted of 142 men, 3 women, 2 children, and 72 wagons. They traveled 1031 miles before reaching their destination. Some members of the company traveled ahead and arrived in the Salt Lake Valley as early as the July 21, 1847. By the 24th of July, the entire company had arrived. B. F. S., "A Prophecy," Juvenile Instructor, 15 February 1882, 63. [Brigham Young Company, Remarks by Surviving Pioneers], in Utah Semi-Centennial Commission, The book of the pioneers [ca. 1897]. Cloward, Thomas Poulson, [Autobiography], in "Utah Pioneer Biographies," 44 vols, 44:2. Cloward, Thomas Poulson, Autobiographical sketch 1894. Earl, Sylvester Henry, 1815-1873, Autobiographical Sketch. Earl, Sylvester Henry, Autobiographical sketch [n.d.], 5-6. 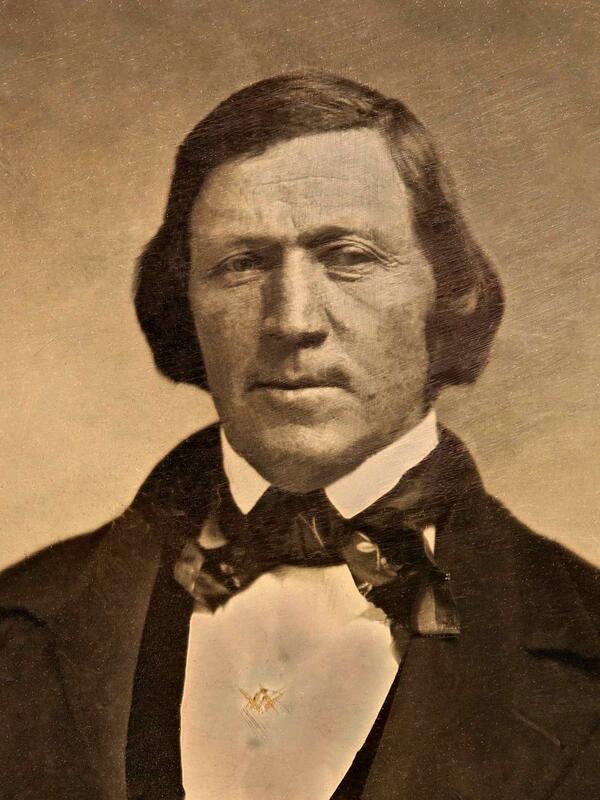 Egbert, Joseph, Reminiscences, in Utah Semi-Centennial Commission, The book of the pioneers [ca. 1897]. Ellsworth, Edmund, Autobiography, in Pearl Ione Crismon Forsberg's "Papers relating to the Edmund Ellsworth and Charles Crismon families," in Utah State Historical Society Cache Valley Chapter, Historical resource materials for Cache Valley, Utah-Idaho, 1955-1956, reel 5, item 5. Farr, Aaron F., Reminiscences, in Utah Semi-Centennial Commission, The book of the pioneers [ca. 1897]. Flake, Green, Reminiscences, in Utah Semi-Centennial Commission, The book of the pioneers [ca. 1897]. Jackman, Levi, Letter, Salt Lake City [Utah] 1850. Jacob Weiler family, Record of temple work [ca. 1895-1900], 75-77. Kelsey, Stephen, [Letter], in "Fifty Years Ago Today," Salt Lake Tribune, 16 June 1897, 371, 407. Kimball, Heber C., to James Smithies, 4 July 1847, in James Smithies, Diary 1846-1859. Lewis, Phillip Bessom, Autobiographical sketch, in 12th Quorum, Biographies, 1844-1894, vol. 1, 1, in Seventies Quorum, Records, 1844-1975. “Life and Journeys of John Somers Higbee,” Iron County Record, 16 February 1929, 1. "Pioneer Describes Arrival Here of 147 Settlers Just 55 Years Ago," Salt Lake Telegram, 23 July 1902, 3. Pratt, Orson, "Interesting Items Concerning the Journeying of the Latter-day Saints from the City of Nauvoo, Until Their Location in the Valley of the Great Salt Lake (Extracted from the Private Journal of Orson Pratt)," Latter-day Saints' Millennial Star, 15 Jan. 1850, 18-19; ibid., 1 Feb. 1850, 33-35; ibid., 15 Feb. 1850, 49-50; ibid., 1 Mar. 1850, 65-68; ibid., 15 Mar. 1850, 81-83; ibid., 1 Apr. 1850, 97-100; ibid., 15 Apr. 1850, 113-15; ibid., 1 May 1850, 129-31; ibid., 15 May 1850, 145-47; ibid., 1 June 1850, 161-66; and ibid., 15 June 1850, 177-78. Pulsipher, John, "John Pulsipher’s History 1827-1891," 51-52. Scofield, Joseph Smith, Diary, 2-9. Shumway, Andrew Purley, Reminiscences 1869. Smith, George A., "History of George A. Smith," written by Albert Carrington, in George A. Smith, Papers, 1834-1875. Smoot, W. A. C., [Reminiscence], in Journal History of The Church of Jesus Christ of Latter-day Saints, 24 July 1907, 26. Snow, Erastus, "Autobiography of Erastus Snow," Utah Genealogical and Historical Magazine , July 1923, 112. Thomas, Robert T., Autobiographical sketch, in 45th Quorum, Biographies, vol. 1, 16, in Seventies quorum, records 1844-1975. Thornton, Horace, Reminiscences, in Utah Semi-Centennial Commission, The book of the pioneers [ca. 1897]. Tippets, John Harvey, Journal 1846 July-1847 June. Weiler, Jacob, Autobiographical sketch 1892-1895, 3-4. Whipple, Edson, [Reminiscence], in Andrew Jenson, comp., Latter-day Saint Biographical Encyclopedia , , 3:561. Whitney, Helen Mar, "Scenes and Incidents at Winter Quarters," Woman's Exponent , 15 Sept. 1885, 57-58. Witt, Michael, Copy and revision of [the] autobiography of Mr. Blackburn, 1966, 11-13. Woodruff, Wilford, "Letter of W. Woodruff, One of the Apostles," in Prophet of the Jubilee, trans. and ed. Ronald D. Dennis , 101. Woodward, George, [Letter excerpt], in Salt Lake Tribune, 30 April 1897, 1. Woodward, George, Reminiscences, in Utah Semi-Centennial Commission, The book of the pioneers [ca. 1897]. Young, Brigham, Letter, 1847 May 28, Camp of Israel, Platte River. Young, Brigham, Remarks, in “The Celebration of the Twenty-fourth,” Deseret News [Weekly], 27 July 1870, 295. Young, Brigham, to Amasa Lyman, July 8, 1847. Amasa M. Lyman collection 1832-1877, Incoming Letters. Young, Clara Decker, A woman's experience with the pioneer band, in University of California [Berkeley] Bancroft Library, Utah and the Mormons collection [n.d.], reel 2, item 45, 7-8.